Upper Clear piece in photo. Designed to be used in conjunction with the RPUP (lower piece). Available for 4-string, 5-string and Seymour Duncan Rickenbacker pickups. The 4001 and 4003 player’s dilemma…you want to remove the pickup cover so you can play normally, but you’re left with a gaping, sharp hole. The Bridge Pickup Plate was designed to replace the original metal plate with a smooth plastic plate that matches your pickguard. 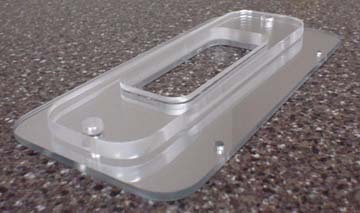 With the optional 1/4″ Clear Pickup Guard, the pickup is protected. We recommend ordering both pieces (RPUP & RPUG) for the best look and maximum protection. Versions for the 4003 S/5 and Seymour Duncan Rickenbacker pickups are also available. Rickenbacker RPUP/RPUG Combo…Buy Both & Save!